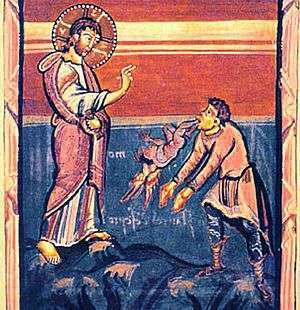 The miracles of Jesus are the supernatural deeds attributed to Jesus in Christian and Islamic texts. The majority are faith healing, exorcisms, resurrection of the dead and control over nature. 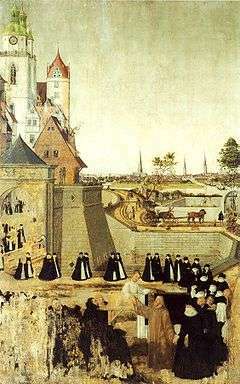 To many Christians and Muslims, the miracles are actual historical events. Others, including liberal Christians, consider these stories to be figurative. 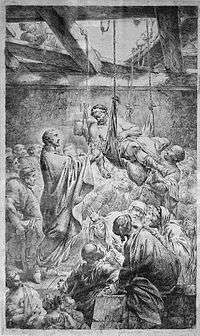 Since the Enlightenment scholars have taken a highly skeptical approach to claims about miracles. 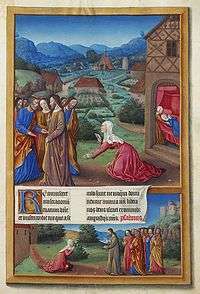 It is not always clear when two reported miracles refer to the same event. For example, in the Healing the Centurion's servant, the Gospels of Matthew[8:5-13] and Luke[7:1-10] narrate how Jesus healed the servant of a Roman Centurion in Capernaum at a distance. 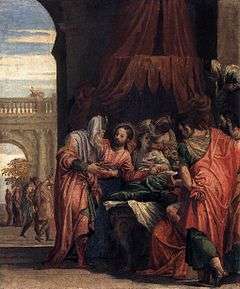 The Gospel of John[4:46-54] has a similar account at Capernaum, but states that it was the son of a royal official who was cured at a distance. 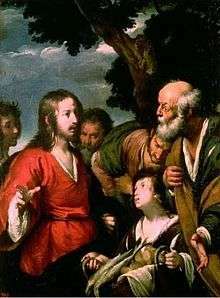 The largest group of miracles mentioned in the New Testament involve cures. 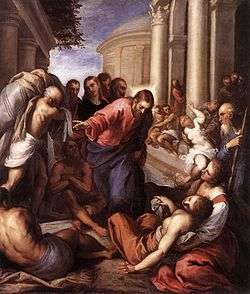 The Gospels give varying amounts of detail for each episode, sometimes Jesus cures simply by saying a few words, at other times employs material such as spit and mud. 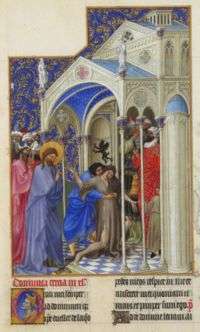 Generally they are referred to in the Synoptic Gospels but not in the Gospel of John. 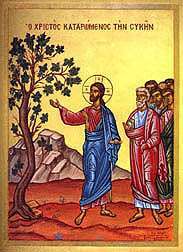 The Mark Gospel also has an account of the healing of a man named Bartimaeus, done as Jesus is leaving Jericho. 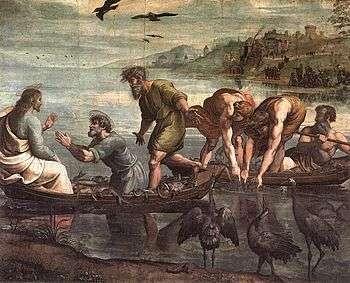 The Gospel of Matthew  has a simpler account loosely based on this, with two unnamed blind men instead of one (this 'doubling' is a characteristic of Matthew's treatment of the Mark text) and a slightly different version of the story, taking place in Galilee, earlier in the narrative. 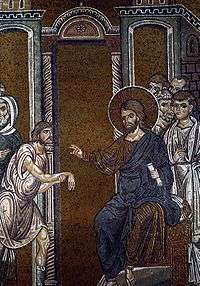 The Gospel of Luke tells the same story of Jesus healing an unnamed blind man, but moves the event in the narrative to when Jesus approaches Jericho. 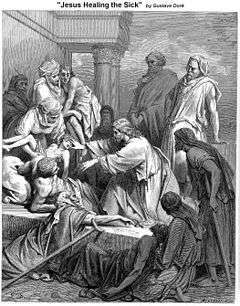 The Cure of a bleeding woman miracle appears in Mark 5:21-43, Matthew 9:18-26 and Luke 8:40-56, along with the miracle of the Daughter of Jairus. 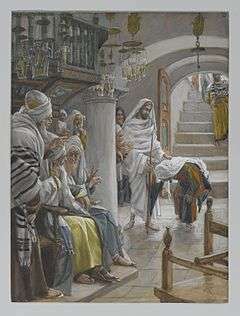 The Gospels state that while heading to Jairus' house Jesus was approached by a woman who had been suffering from bleeding for 12 years, and that she touched Jesus' cloak (fringes of his garment) and was instantly healed. 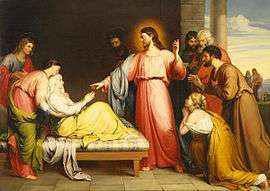 Jesus turned about and, when the woman came forward, said "Daughter, your faith has healed you, go in peace". 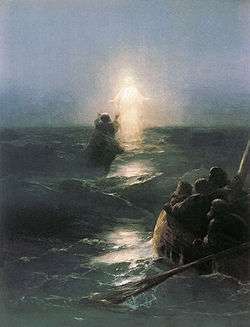 In the Book of Mormon Jesus appears as a resurrected being and performs additional miracles. 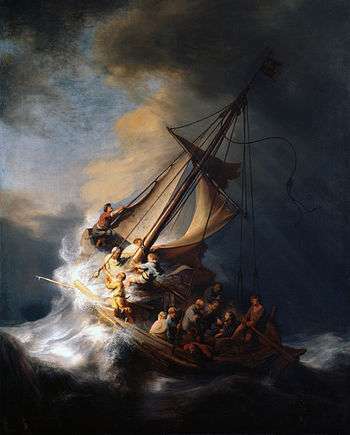 ↑ Baker Theological Dictionary of the Bible defines a miracle as "an event in the external world brought about by the immediate agency or the simple volition of God." It goes on to add that a miracle occurs to show that the power behind it is not limited to the laws of matter or mind as it interrupts fixed natural laws. So the term supernatural applies quite accurately. Elwell, Walter A., ed. (2001). Baker Theological Dictionary of the Bible. Baker Academic. ISBN 978-0801022562. ↑ Mark 8:11-12, Matthew 16:1-4, Matthew 12:38-40, Luke 11:29-30. Cited in Funk, Robert W., Roy W. Hoover, and the Jesus Seminar. 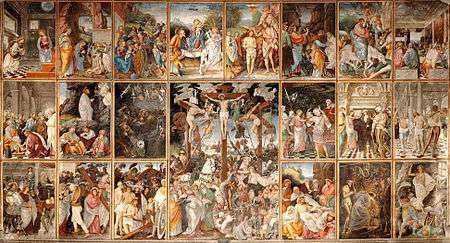 The five gospels. HarperSanFrancisco. 1993. p. 72-73. 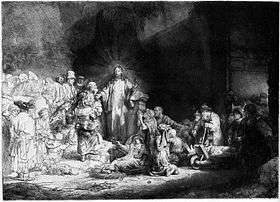 ↑ See discussion under Liberal Christianity and miracles. ↑ Daniel J. Harrington, The Gospel of Matthew (Liturgical Press, 1991) page 133. ↑ Brent Kinman, Jesus' Entry Into Jerusalem: In the Context of Lukan Theology and the Politics of His Days (BRILL, 1995) page 67. 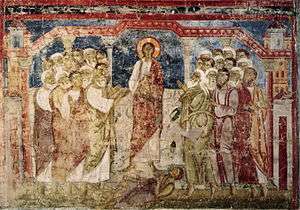 ↑ Mark 5:21-43, Matthew 9:18-26 and Luke 8:40-56. ↑ Graham H. Twelftree, Jesus the Miracle Worker: A Historical and Theological Study (InterVarsity Press, 1999), page 283. ↑ Wendy Cotter, "Miracles in Greco-Roman antiquity: a sourcebook" (Routledge, 1999) pp.11-12, ff. ↑ Ehrman, Bart D.. Jesus, Interrupted, HarperCollins, 2009. ISBN 0-06-117393-2 page 175: "We would call a miracle an event that violates the way nature always, or almost always, works ... By now I hope you can see the unavoidable problem historians have with miracles. Historians can establish only what probably happened in the past, but miracles, by their very nature, are always the least probable explanation for what happened"
↑ Funk, Robert W. and the Jesus Seminar. The acts of Jesus: the search for the authentic deeds of Jesus. HarperSanFrancisco. 1998. p. 566.